The Davis Aggie Lions Club recognizes that recovery after a disaster is not an immediate process. As a result, we resolve to provide continual donations to areas affected by natural disasters through our donations to the Lions Club International Foundation (LCIF). We are currently focusing our efforts on Typhoon Haiyan relief. 100% of the money raised will be sent to Lions Clubs around the Philippines to help in their rebuilding efforts. We are moving our efforts from campus to the Davis Farmer's Market where we are offering the bracelets on a donation basis. Tabling dates for this event will be noted on our calendar and will be sent out through email as well. Flowers for Adalia is a new campaign created by the Davis Aggie Lions Club. We will inform the community about the disease Progeria while raising money to donate to the Progeria Research Foundation. This year our campaign will be donated under the name of Adalia Rose, one of the children affected by Progeria. Even though she is affected Progeria, Adalia is a cheerful girl who enjoys dressing up. 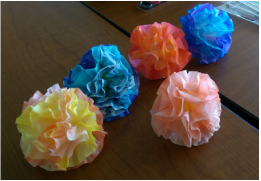 To reflect Adalia's bright personality, we will be making flower headbands, hairbands, and bracelets to help fundraise for the cause. If you are interested in donating please contact committee head Vivian Chen (vfchen@ucdavis.edu) or visit us at our Picnic Day booth. 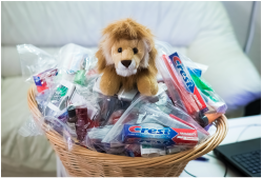 Lions of DALC in 2015 came together to put together a wonderful basket of goodies to be donated to a local homeless shelter in Davis. We spent the remainder of the year gradually gathering the supplies for the basket and assemble them for delivery in spring. If you have any donations (deodorant, toothpaste, combs, shampoo, etc) please contact the event chair Kristin Slingerland. Any donations would be greatly appreciated (must be unopened/unused). 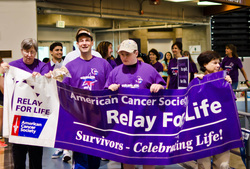 Relay for Life is an annual nation-wide event. People join teams with their churches, volunteer groups, companies, etc., and work to raise money for the American Cancer Society. On the day of the event, team members will walk the track in shifts while others use the opportunity to raise money. You can do your part by registering for the DALC team. Registration is only $10 and it includes a shirt. Plus the money goes to a good cause! Team members are asked to contact friends & relatives for donations. Or you can participate in the various fundraisers the club will be hosting. If you cannot make the event you can still join the team or make a donation to the cause! Annual eye glass collection event for the Davis Aggie Lions Club. Club members walk around the Davis & neighboring city areas and spread cheer while collecting glasses to be donated to the Folsom Prison Project. 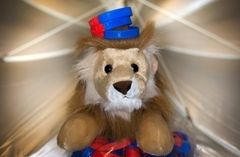 This year (2014) the club will also be spreading the word about Lions Eyes Across California. Results: Over 100 pairs of glasses collected.